Description: The northbound manifest has arrived and is preparing to blast by me on the main. This train will be instructed to take the siding in Noble to meet another southbound manifest which will be led by another ES44DC, in H2 paint. Description: This is the manifest viewed in Purcell. It is now in the hole in Noble waiting on the southbound to pass. Description: Westbound pig train with UP power third in line. This train would pull all the way out and back into Clyde Yard again. 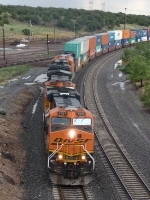 Title: ES44AC leads intermodal train. Description: THESE UNITS ARE DPU's STOPPED FOR A CREW CHANGE AT EL GARCES STATION, A GRAND STRUCTURE FORMALLY A HARVEY HOUSE NOW BEING RESTORED. Description: Leading a military train crossing the Riley/Pottawatomie County line BNSF 7526 was trailing. Sadly the thought to roll down the window wasnt in my head at the time. Description: CSX Q368 departs Chicago, and begins it's journey east towards Cumberland, MD. Description: Heading up a westbound Q train in a lite drizzel. Description: About to head under slowly, in a litle drizzel. Description: It is the hour of the long shadows as BNSF 4175 chases the setting sun towards the summit at Yampai. Darkness will bring no let-up in the activity, however. Description: BNSF 5522 as DPU.